Honeybees are hurting. What else can pollinate our food? Farmers are turning to other types of bees — like the blue orchard bee, the bumblebee and alfalfa leafcutter — that have proved to be effective pollinators of some crops in certain settings. OMAK — Jim Freese grows apples, pears and cherries on 45 acres in the north-central part of this state, on sagebrush-studded land his grandfather bought in 1910. Walking among trees laden with shiny red cherries, Freese recalled that four years ago his trees were not producing well and his farm was financially struggling. Like many growers, he had been relying on rented honeybees to pollinate his cherry trees every spring, along with wild bees and other insects. But that year, spring was expected to be cool. “Honeybees will just sit in the hive in cooler weather,” Freese said. He needed a way to ensure more flowers would develop into fruit than in the past. At a horticulture meeting, he learned that blue orchard bees — a native species that does not make honey or live in hives — could be used to supplement honeybee pollination. Blue orchard bees will fly at cooler temperatures. Freese bought 12,000 cocoons and set them in his orchard to emerge when the trees bloomed. His investment paid off. “We doubled our cherry production from any previous record year,” he said. 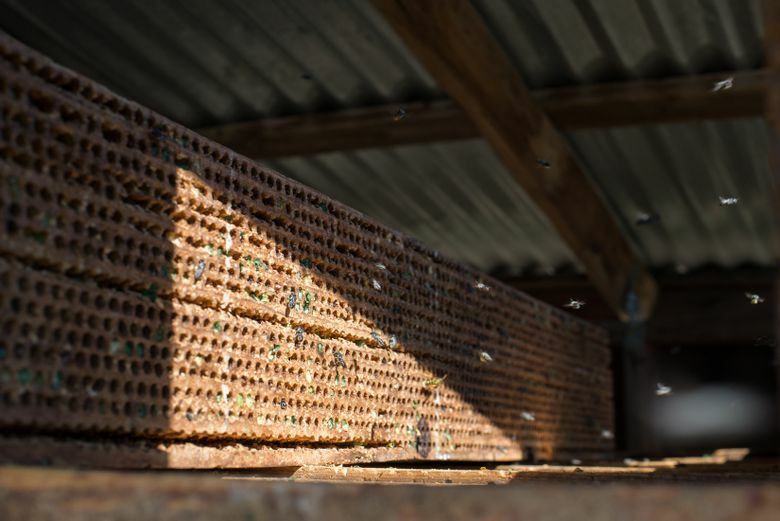 The Freese orchard is one of many commercial agricultural operations around the United States considering pollination with alternative bee species now that the honeybee is beset by problems. The honeybee, Apis mellifera, has been the dominant pollinator for decades but now is threatened by pesticides, pathogens, parasites and poor nutrition. This past year, beekeepers in the United States lost an estimated 40 percent of their managed honeybee colonies, according to the Bee Informed Partnership, a nonprofit that advises beekeepers. Some years that number is even higher, according to Mark Winston, a professor of apiculture at Simon Fraser University in British Columbia, Canada, and author of several books on bees. “Is there another agricultural enterprise that accepts an annual loss of 40-45 percent of its animals?” he asked. These losses drive up prices for farmers who rent honeybees to pollinate their crops, straining their businesses. Honeybee prices have nearly quadrupled since 2004, even as demand for pollination services is growing. One-third of our food — including almonds, apples, blueberries, pears and tomatoes — must be pollinated to grow. Some scientists warn of risks to agricultural food supplies if there are not enough pollinators. As honeybee prices continue to rise, farmers are turning to other types of bees — like the blue orchard bee, the bumblebee and alfalfa leafcutter — that have proved to be effective pollinators of some crops in certain settings. “It’s a question of having the right bee at the right time,” said Theresa Pitts-Singer, a research entomologist at the Department of Agriculture’s Logan Bee Lab. Pitts-Singer and researchers across the country have been studying how so-called integrated crop pollination — or combinations of varying bee species — can help growers ensure reliable pollination. The Integrated Crop Pollination Project (ICP), a public-private partnership funded by the Department of Agriculture, has explored habitat enhancement for wild bees, improving farm-management practices, and the use of diverse or “alternative” bee species. The bumblebee, Bombus impatiens, can be an effective alternative to honeybees for pollinating watermelons and lowbush blueberries. The alfalfa leafcutter bee, Megachile rotundata, is responsible for pollinating most of the alfalfa grown for seed production. 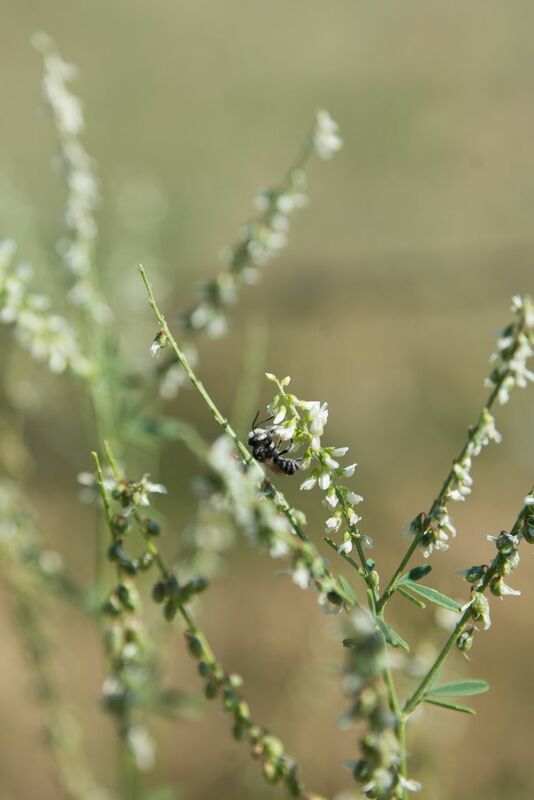 The ground-nesting alkali bee, Nomia melanderi, also pollinates alfalfa, and the blue orchard bee, Osmia lignaria, is effective for tree fruits and nuts. Blue orchard bees are natives to this continent, and were here long before Europeans arrived with honeybee hives. Pollination in large almond and cherry orchards increased when they were used alongside honeybees, recent studies showed. There is a particular synergy between the two bee species, which have very different behaviors. Honeybees forage widely, self-propagate and live in large colonies that are easy to move. Blue orchard bees are solitary, and all females function as both queens and workers. They fly about four to six weeks in early spring. The two types of bees collect pollen differently — honeybees gather pollen only on their legs, while blue orchard bees gather it with their abdomens, too. They also fly at different heights in the tree canopy. Better pollination can lead to bigger yields, as in the Freeses’ case, which can mean more profit. To explore the economics, Pitts-Singer and other scientists conducted a cost-benefit analysis of using blue orchard bees and honeybees to pollinate almond trees in California. The analysis, published recently in Journal of Economic Entomology, showed a potential tenfold increase in profit per acre with the introduction of blue orchard bees. Further study is needed to determine whether such an increase is possible in real-world settings, Pitts-Singer said. Scientists noted that farmers would earn greater profits if they saved blue orchard bee progeny from year to year rather than buying new cocoons every season. That requires careful maintenance of nesting materials and cocoons to prevent disease. In the wild, blue orchard bees make nests in small cracks or holes. 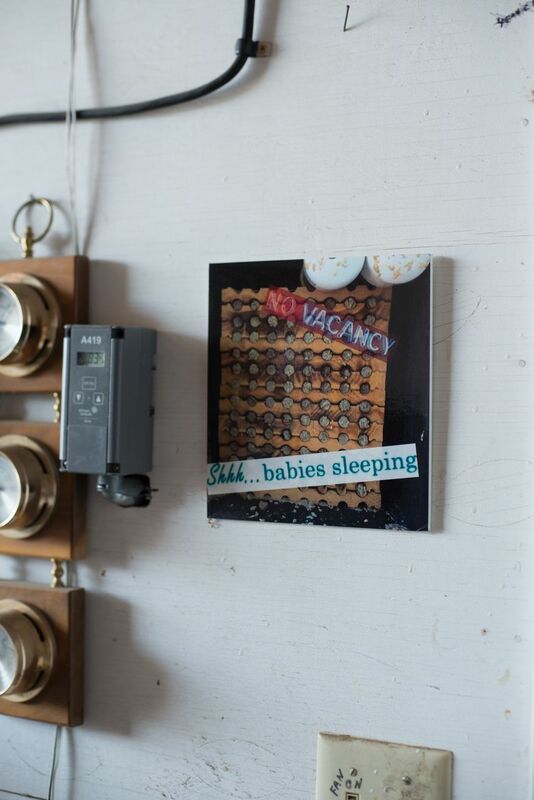 But in agricultural settings, artificial nesting blocks or paper tubes are used. For Jim Freese, adopting blue orchard bees has meant learning how to care for them. He makes sure a supply of mud is nearby for females to build nests with, cleans the nesting materials and cocoons each winter, and keeps cocoons in a refrigerator until early spring. “If I double my cherries, I’ll do the extra work,” Freese said. Like honeybees, other bee species face risks from chemicals and pathogens. Farmers can support managed bees and attract wild pollinators by planting hedgerows and wildflowers and by reducing the use of pesticides, experts say. With cherry and almond blooms lasting only a short time, bees in orchards need other flowering plants nearby for food. 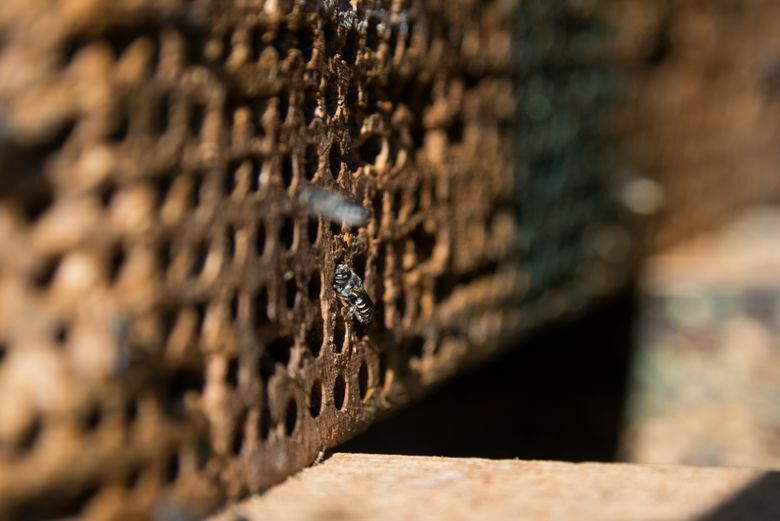 As the interest in alternative bees increases, the Department of Agriculture is looking at how to prevent the transmission of pests and pathogens around the country, and at how well bees from, say, Washington state will do on the East Coast. Pitts-Singer encourages farmers and orchardists to pick the right bees for their region and to get the cleanest bees possible. Freese pays far more to buy blue orchard bees — 50 cents each — than he does to rent honeybees from a local beekeeper. But he said that the cost of honeybees is going up, and the cost of blue orchard bees is going down. Effectiveness is the deciding factor. “You could say the most expensive pollinator is the one that doesn’t work,” he said. 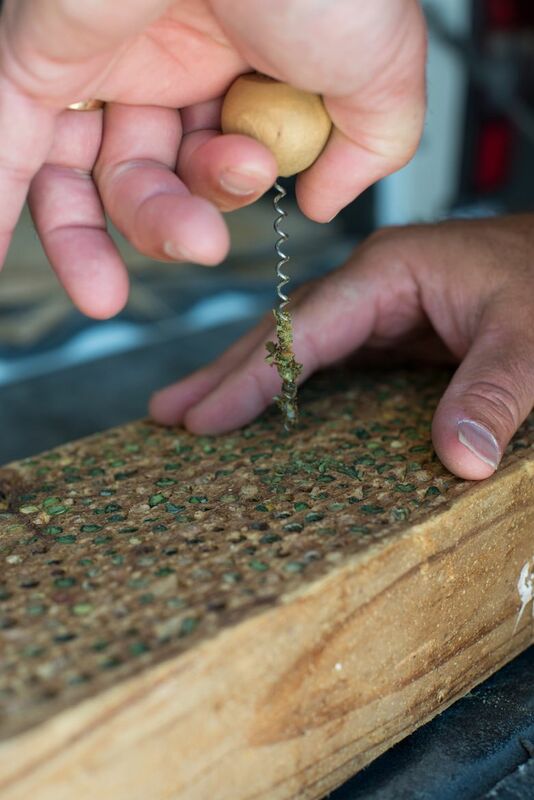 His supplier, Jim Watts, of Watts Solitary Bees, in Bothell has worked with leafcutter bees all his life and started propagating blue orchard bees a decade ago. While the blue orchard bee industry is very small, it is growing rapidly. 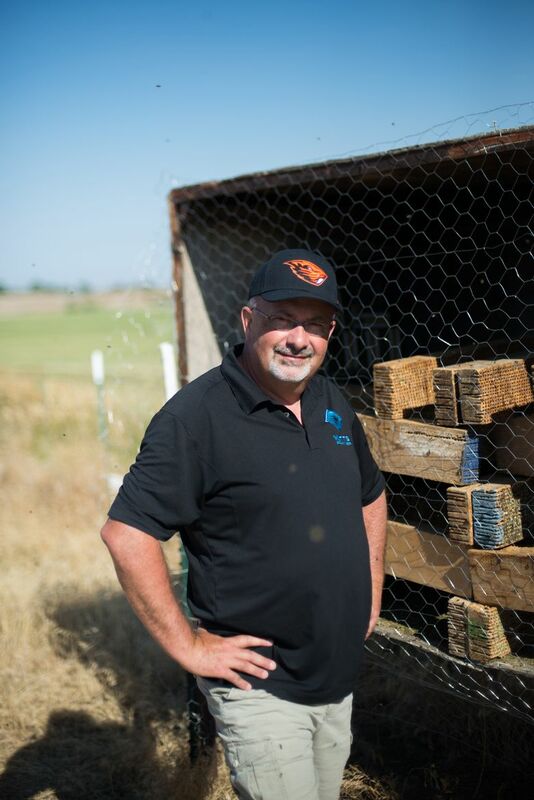 One of the largest distributors of solitary bees in the country, Watts meets with farmers throughout the West about pollination. Based on their crops and acreage, he provides bees, materials and consulting time to answer questions. Isaacs, of Michigan State, agrees that diversity is important for reliable results. “Using wild bees and managed bees is an insurance policy against honeybee declines,” he said, adding that a suite of pollinators also hedges against weather extremes. At a time when human food needs are growing and honeybees are threatened, farmers may be looking for just such an insurance policy.